The Kabalabda puzzle consists of a white ball that fills the inside a transparent shell. The ball has a pattern of twelve black pentagons on it arranged like a football. Each pentagon also has a white dot. The shell on the other hand has 12 pairs of black dots on its surface. 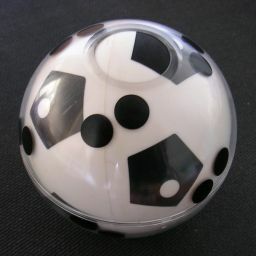 The aim is to arrange the ball so that the puzzle looks like a football, so all the black dots must lie on top of the black pentagons in such a way that all the white dots are covered up. The shell has two holes in it through which you can push around the ball. The football pattern of pentagons has dodecahedral/icosahedral symmetry. This means that there are 60 ways of rotating the ball such that the black dots lie over the pentagons (12 pentagons to choose from for one pair of dots, times 5 ways to rotate it so the other pentagons line up with the black dots). In only one of these ways are all the white dots covered up. It is possible to systematically try out all possibilities. The easiest way is by keeping track of a single white dot on one of the pentagons on the ball. Place this white dot under each of the black dots in turn, always rotating the ball to make all the black dots cover the pentagons. Only one of the 24 black dots will lead to a solution. The solution is shown below. The seams in the shell and in the ball are shown. The seem in the outer shell has a small notch that keeps the two halves aligned, which in the solution happens to lie above the ball's equatorial seam.